The seemingly non-stop rain has been a bit of a challenge to work around—its seems every time the ground gets dry enough to weed or seed into, the rain comes back. Nonetheless we’ve been able to squeeze some weeding and seeding and are largely on track with our planting schedule despite. Part of making sure the farm runs smoothly is over-planting crops to hedge against the vagaries of the weather and the myriad of other factors that effect plants. 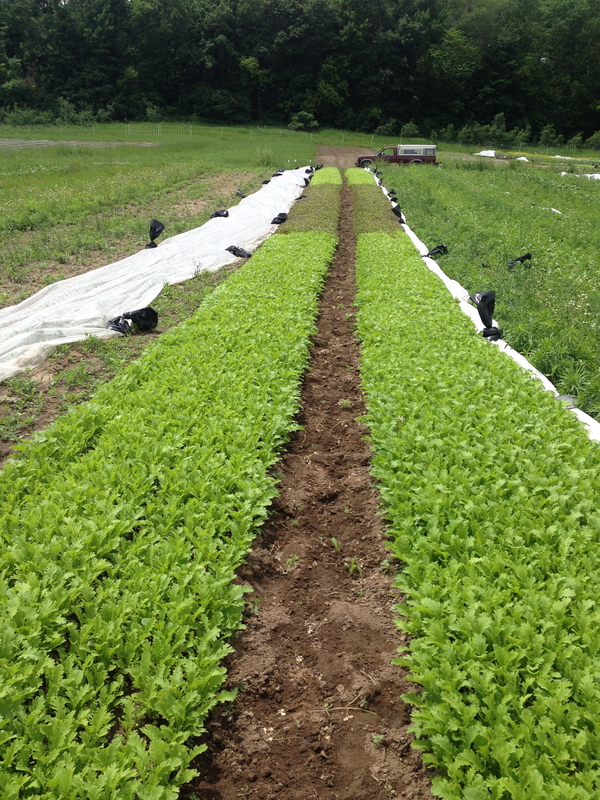 The head lettuce for the week had an unusual amount of rot around their bases due to not being able to fully dry out with the rains, but fear not, there is plenty to go around. Heather and I were gone Thursday through Sunday to Indiana for Heather’s father’s funeral. It was good to be around family and friends during such a hard time, thank you to everyone who sent their condolences. Thankfully our crew Megan and Ben do such a great job helping us run the farm that we can have them take the helm for several days under such unfortunate circumstances—normally being gone just one day can make me feel like everything has slipped out of control in the gardens. We are super excited to have peas around this year. Last year we were unable to plant them in time (remember when it snowed in April last year? Yikes.) and just did without. This variety is called Sugar Anne. 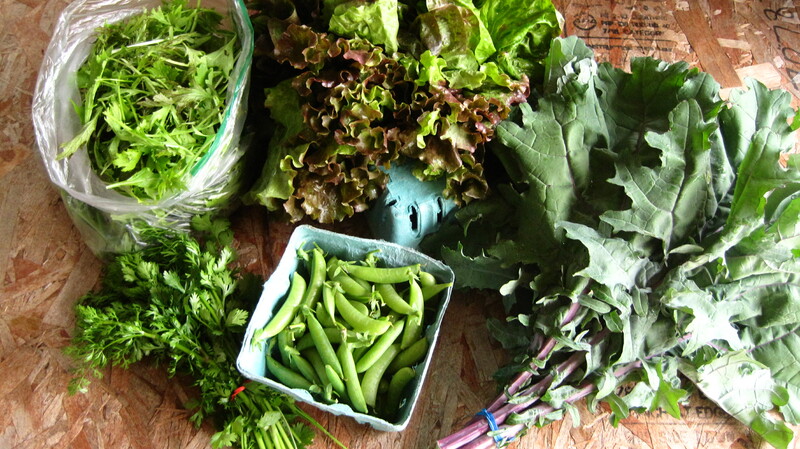 I love snacking on them raw, but they are also great to stir fry or chop up raw into a salad. Snap peas are meant to be eaten whole, pod and all. Some people prefer to remove the “string” from the pod before they eat them. 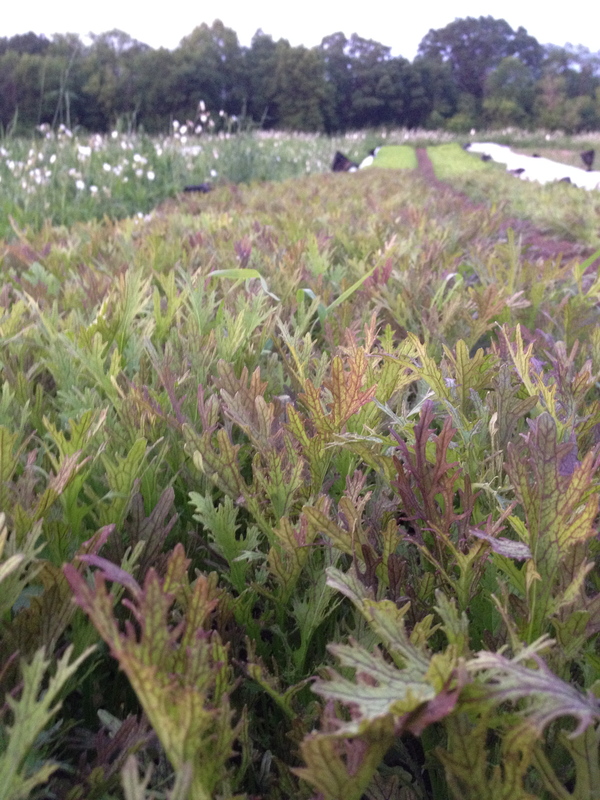 Close up of Ruby Streaks (above) and the Spicy Salad beds before harvest (below), you can make out the three different kinds of greens in each bed. Our spicy salad is a mix of three of our favorite mustard greens: Mizuna, the pointy green leaf, provides a nice mild base to the mix, tempering the hot flavors of the other two. Ruby Streaks, the scarlet finely serrated leaf, provides a kick with a flavor I find most a kin to potatoes. And Suehlihung, a bit thicker, broader green leaf, that adds texture and a nice full flavor. 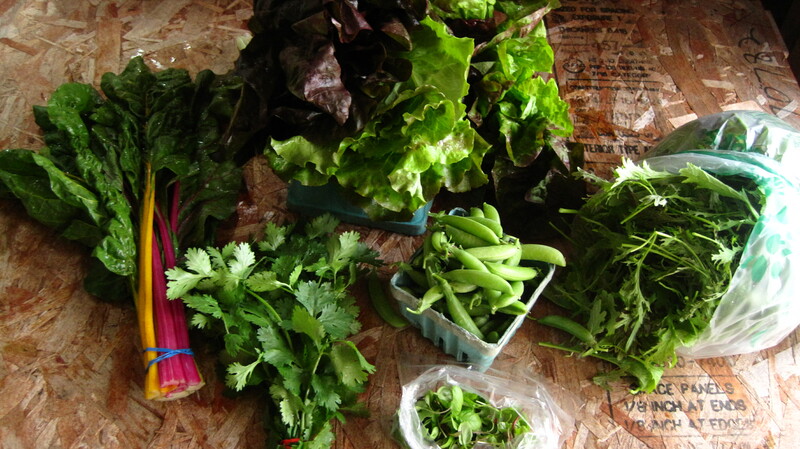 Use this mix as you would a raw lettuce mix or lightly cook it to mild the flavor. It is fantastic mixed into omelets. 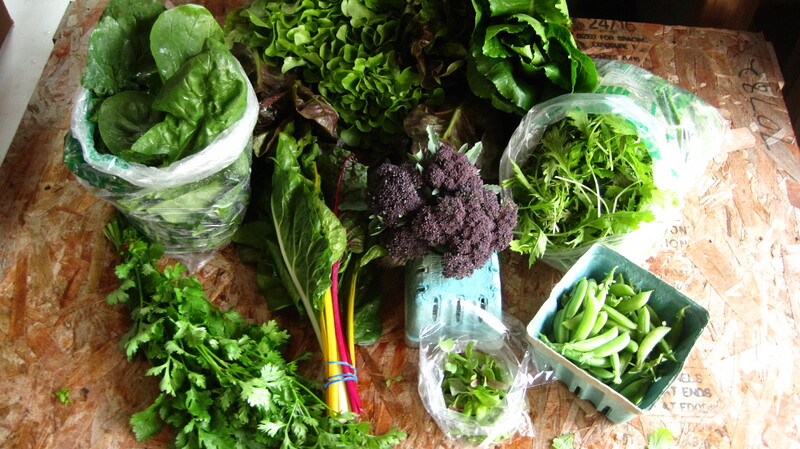 Fulls and mediums are receiving microgreens this week. Often used in restaurants to add an elegant burst of color and flavor, microgreens can be used in a similar fashion as you might an herb. Scattered across fish, added to the top of a salad for flavor or sprinkled on top of side dish. Also in medium and full boxes is swiss chard. One of the most beautiful in the vegetable kingdom, chard comes in an array of different bright colors. Chard can be used much like you would spinach and is often lightly cooked or steamed and served as a side dish. Some people also like it raw, although I find the sugars in the stem make my throat a little itchy unless it is cooked slightly much like raw beets do (in fact beets and chard were bred from the same parent plant). 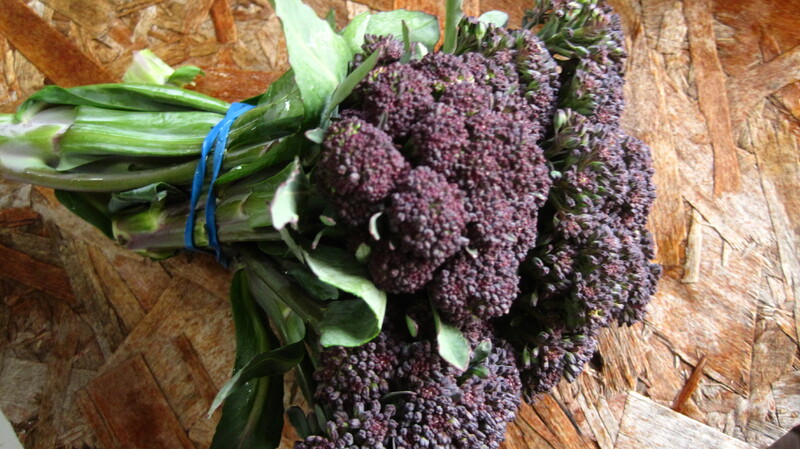 Full shares are getting a new addition to the farm this year: Rosalind Broccoli, a purple broccoli. Word on the street is that it will fade to a more green color when cooked, so choose your dish wisely if you want to show off this flashy brassica. This plant has not been enjoying the early heat this summer and is putting its heads on sporadically–I’m not sure if everyone will be getting Rosalind this year like we hoped, but not to worry, there is plenty more broccoli on its way really soon. Rosalind Broccoli (above). 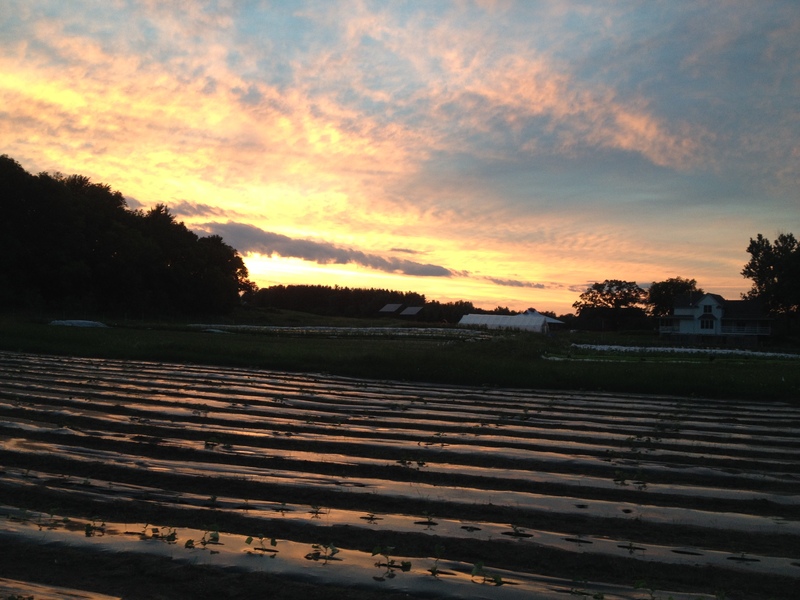 Last nights sunset viewed from the melon and winter squash patch (below).